AGI offers regularly scheduled public UX classes, private UX training and online UX courses. Public user experience courses available at our classrooms in Boston, New York City, and Philadelphia, or attend our live online UX classes from anywhere. Private UX workshops for teams are available at your location or ours. For those seeking a more comprehensive set of UX courses, see our UX certificate program. If you need help with an existing project, UX Consulting is available from our team of UX and UI experts. In this UX class participants learn the core principles of user experience design and gain an understanding of the user experience design process. Learn all stages of UX design, from determining a UX strategy, developing user scenarios, creating UX personas, UX research strategies, prioritizing content, developing an information architecture (IA), testing user interface (UI), and incorporating feedback. This UX training provides a strong foundation for creating user-centered designs. 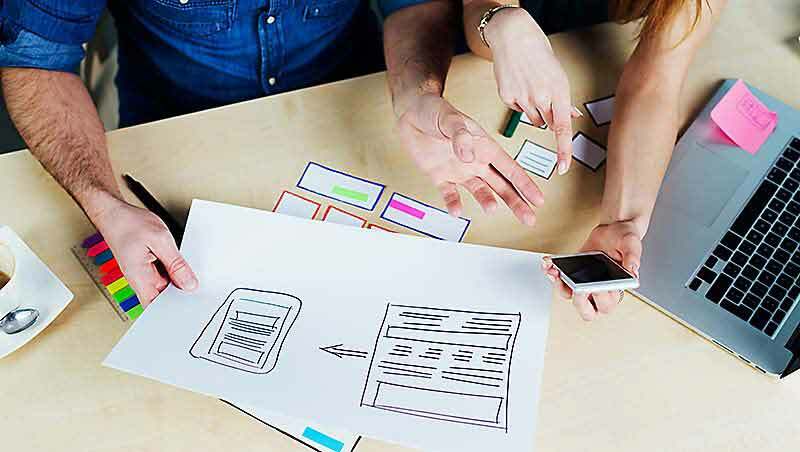 Learn Rapid Prototyping skills in this UX training course. Participants discover how to efficiently create, share and test concepts, designs and structure for websites and apps. Learn best practices for UX prototyping and testing before investing in final user experience designs. Gain an understanding of the process for rapid iteration of UX designs and creating mockups. Find out ways to improve the efficiency of the design and development process in this Rapid Prototyping UX workshop. In this information architecture course discover methods and processes for structuring and organizing content to build effective user experiences. Learn to prioritize, sort, structure and organize information so that it can be found in a way that is consistent and predictable. As part of this UX course participants find out how to evaluate existing content and assess new content needs. Participants also learn to organize and structure content, as well as define navigation. Learn about UX for phones, tablets, and touch-screens along with special considerations when defining their UX and UI. This workshop teaches usability and interaction factors that impact mobile, tablet, and phone UX. Participants in this UX course discover how to create interfaces and interactions that are optimized for mobile and touch input. Learn how usability issues such as finger size, touch targets, single-hand use, and environment impact UX, and how to address these factors. Learn to use Adobe Experience Design (XD) for prototyping apps and websites. This UX course emphasizes efficient use of Adobe XD as a testing and prototyping tool. Learn to create app simulations, define navigation, build screens, and interactions. This Adobe XD course is useful for UX designers, developers, business analysts or anyone involved in the UX and UI process. In this hands-on Sketch class learn to efficiently create UX prototypes for websites and apps. This Sketch course provides professionals involved in the design, development and planning of websites and apps with the skills to efficiently create and test interactive prototypes. This Sketch workshop is suitable for UI and UX professionals, business analysts, developers, and product managers. This Sketch workshop is available independently or as part of the comprehensive UX training offered at AGI. This UX course addresses the unique design considerations for Windows 10 devices. Learn the design principles for creating Windows 10 apps that work naturally with touch and various input devices. This UX workshop empowers you to create more appealing applications that deliver a consistent user experience leveraging the capabilities of this modern operating system. Learn to use Microsoft's Fluent Design System for creating modern apps. Contact AGI to request course dates. In this UX course discover how to use tools such as Illustrator and Photoshop to create UX assets and build UX documentation necessary for delivering a final user interface. This UX class is primarily offered for participants in the UX Certificate program, and is also available as a private class for groups. This UX course consists of a practical project in which students apply skills learned across the UX Certificate program into a project that is selected by the student and reviewed with their instructor. The UX project starts with planning, meeting with the client, creating a creative brief, developing the site or app, client review and feedback. It concludes with final delivery and project review by the instructor. In this UX workshops participants work with their instructor to create an online portfolio showcasing their talents. Working with practicing professionals, students receive guidance determining which projects to showcase, and evaluate the most effective format for presenting projects, along with the design process and skills involved in their creation. This UX course helps participants create a UX portfolio showcasing skills and capabilities for clients or hiring managers. Attend introductory to advanced UX Classes in our training centers, online, or at your office. Our regularly scheduled, public UX Classes include introductory through advanced training. Most courses are offered monthly. We offer live classes led by an instructor in the same classroom with you. All UX courses can be delivered on-site at your location. Call or complete the form on the above link to receive information about classes at your location. We deliver on-site classes across the U.S. and globally. Live online UX courses provide you with a small group course that you can take from anywhere with a high-speed Internet connection. You can ask questions, hear and talk with the instructor, even share your screen as part of these interactive classes. All classes in Boston, New York City, and Philadelphia start are 9:30 a.m. to 4:30 p.m. and are led by a live instructor in the same classroom with you. All online classes are led by a live instructor and run from 10:00 a.m. to 5:00 p.m. Eastern Time. Need help choosing the right UX Classes ? We offer regularly scheduled, public UX Classes at the following locations. Most courses at our training centers are offered monthly, and occur with a live instructor in the same classroom with you.